Pam proofed yesterday’s post, “When the Moon Dined from a Stellar Mangar”and found some improvements, including adding text labels to aid in finding Cancer constellation elements. You will find I replaced photographs in the original post and well, all the major elements of Cancer are labeled. Here is an explanation of the new elements. You can now trace the “Y” constellation pattern, with Alpha and Beta Chancri (Latin for “of Cancer”) the two claws and Iota the tail. Both elemetns of Iota, a visual binary star system, are there. They are wonderful viewed with a telescope. Near Alpha is M67 (Messier Object 67), another galactic cluster of gravitationally bound stars. It is quite faint in this photograph. Colored lights of our skies are a trigger for the imagination. The sky is a storybook to be written by the mind and passed along in language. The 3,000 observable stars and planets visible on any one moonless, clear night away from artificial lights draw on the human obsessional skill for pattern recognition. Over millennia, stars along the path of the planets and sun through the sky held a special place for careful observers. Twelve patterns were imagined, each a named constellation. The word “constellation” means “to know from the stars.” Indeed, we can know much from the constellations. For example, it is winter in the northern hemisphere when the constellation “Cancer” (The Crab) is high in the night sky. Click photograph for my OnLine Galleries. Clicking the other photographs in this post will yield a larger image. 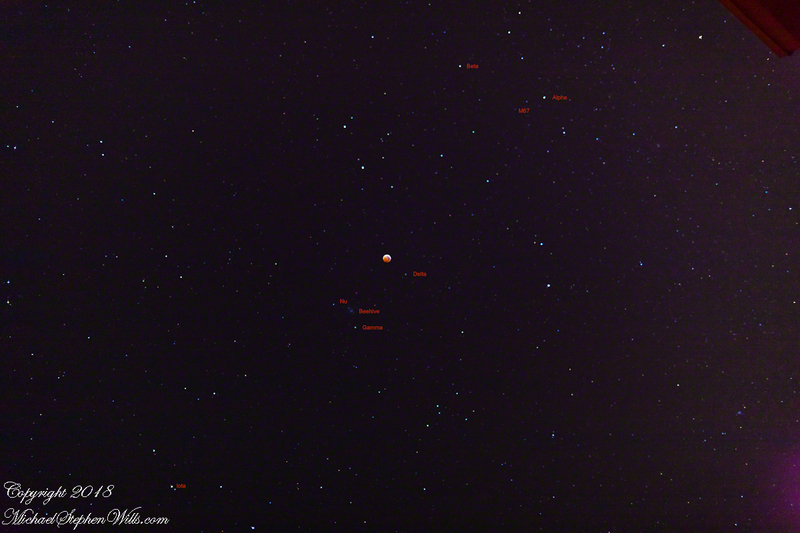 On the evening of January 20/21, 2019 the full moon climbed from the horizon (Click this link for the first post of this series “Total Lunar Eclipse of 2019…”) to a point high overhead were it appeared to float among the stars of Cancer, the crab. On the way, the disk darkened as its orbital path brought it into the earth’s shadow. The surrounding stars emerged from the darkening full moon glow. 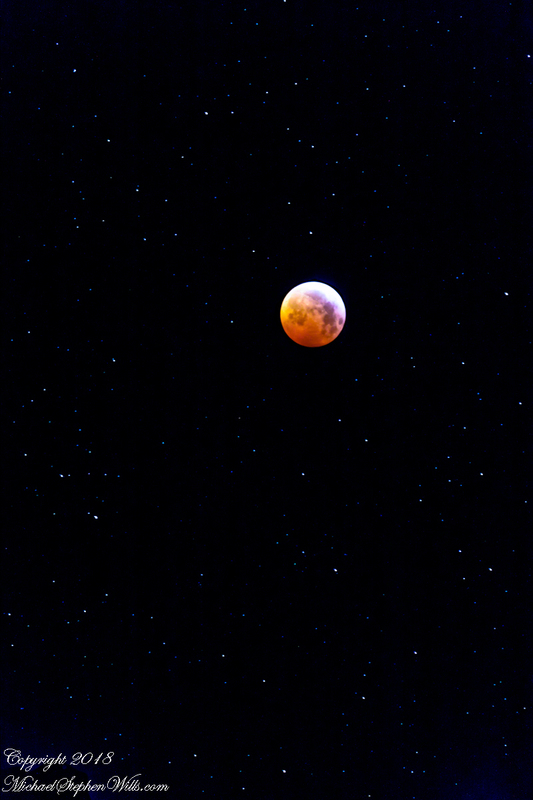 I captured the sight using a Canon dslr, the Canon EF 24 mm f/1.4L II USM lens mounted on a tripod by setting the ISO to 3200 to reduce the exposure to 1.3 second and placing the auto exposure area (a feature of the dslr/lens combination) away from the full moon. Additionally, the moon is overexposed on the original image, for the following I used Photoshop to cut and paste the moon from the last photograph of this blog, reduced it to the approximate angular diameter of the moon and pasted it over the overexposed disk. 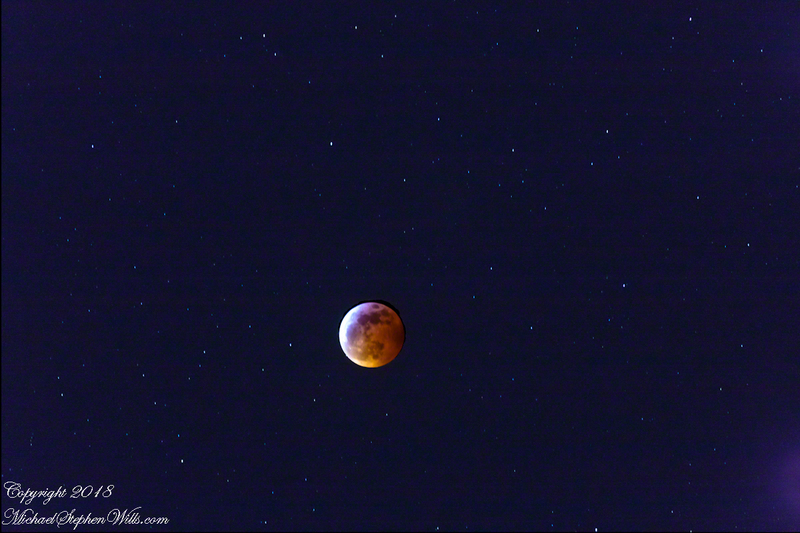 There are better astrophotography images of this event, this image is mine to use and adequate for this purpose. Cancer is difficult to trace, the constituent stars are all dim. Hint: click on any of the following photographs and a new page will open with a larger resolution image. What is striking in the following photograph are the number of apparently paired stars. Our sun is an exception, it is not part of a star system; even so, most of these pairings are line of sight, not physical star systems. For example, starting from the “red” moon there is a faint star, “Delta” of Cancer. Trace an imaginary line between the moon and Delta, in your mind move the line down and a little to the right to a pair of dim stars, “Nu” and “Gamma” of Cancer (left to right). The two are not a system, being 390 and 181 light years away. Each is a multiple star system in itself as is Delta. The three are on the back of Cancer, with two stars on the upper right being “Alpha” and “Beta”. A most interesting object of this photograph, well worth the price of binoculars, is between Nu and Gamma and a little higher, towards the moon. It was what I saw the first time viewing this photograph: a cluster of stars called “The Beehive.” This was how I identified the location of the moon on the back of this crab. 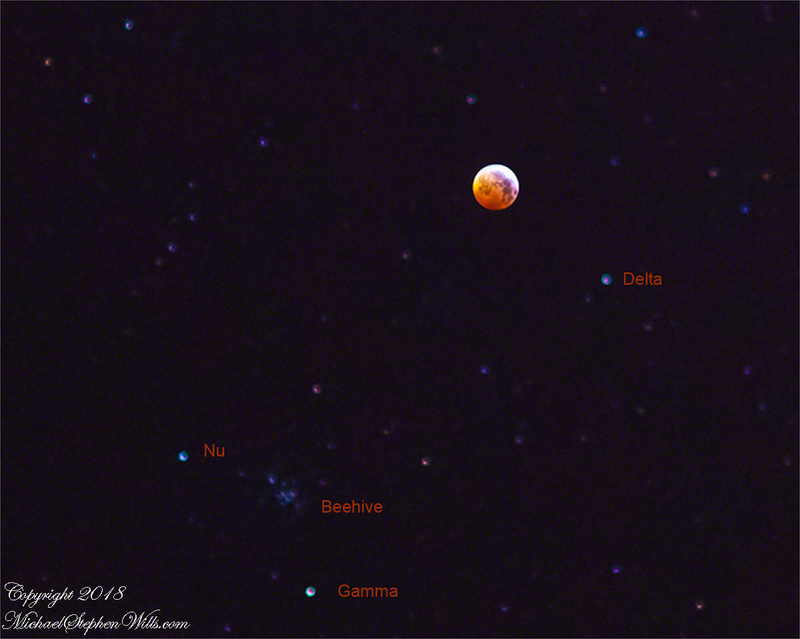 For the following photograph I cut/pasted/enlarged a square with the (enhanced) Moon, Delta. Nu and Gamma, below, with the Beehive between them. See that the stars, though “fuzzy”, have colors. Delta is a orange giant, also known as the “Southern Donkey”. Gamma, the “Northern Donkey,” and NU are white. The back of the Crab holds a two donkeys eating from a manger, a Galactic Stellar Cluster name “The Beehive.” This night the moon joined the feast. With binoculars (or telescope with a wide field eyepiece), the Beehive is a glorious spectacle of 1,000 gravitationally bound stars, a mixture of colors from blue to red. It was one of the first objects Galileo viewed through the telescope, picking out 40 stars. In later years it was here we found the first planets orbiting sun-like (i.e. having the characteristics of our yellow star) stars within a stellar cluster. In spite of being 600+ light years distant the Beehive was known since ancient times, being visible without a telescope in clear, dark skies. A glorious moon at full totality is captured in the following two photographs. I used the dslr at 3200 ISO with the Canon EF 70-300mm f/4-5.6L lens at 300 mm. Setting the exposure area to the Moon, the exposure was 3.2 seconds. In the first photograph, I especially enjoy the effect modeling of the shadows does to make the disk appear round. The field of view does not include Delta, Gamma, Nu or the Beehive. At this time I was not aware how close the Beehive was, or even that the Moon was in Cancer. The beauty of the moon floating among the stars is apparent. An early thought of mine, as a child, was to wonder, “How large does a person grow?” If growth was perpetual, there was no end to how large I will become; yet, tested against observed reality, “Why was it the case this was unlikely?” Years later, when recalling this, I understood my intuition touched upon the logarithmic spiral and mollusk shell. Sea Oat stalk, photographed above, after it dries slowly in the sun and wind, curls into a logarithmic spiral. One two dimensional spiral may be compared to another by measuring the rate and direction of opening, the increase in distance between the part closer to the source and the outer swirl. The growth of all shells follow a logarithmic spiral in three dimensions where the progression from a staring plane, as well as the direction, up or down from the plane, is an element. Sea shells give evidence to my question of “how large can one grow.” The size of each of the millions encountered on a beach is an example of a life ended. Each of record of the length and character of the organism. For example, a close inspection of the bottom shell of the above photograph, a tellin of the family Tellinidae, reveals the spiral is growing toward the surface of the sand. Imagine wrapping your hand around the outer edge of the tellin with your thumb pointed down. Each of the four shells of the above photograph had a mate, were one of a pair. Types of shells share characteristic pair symmetries. For example, a pair of tellins display a type of asymmetry called chirality, also called “handed-ness” after the same property of your right and left hands. One shell half (from the same individual) is the mirror image of the other, each unbalanced as the growth spirals toward opposite directions. When I started beachcombing, examining collected shells I did not have a pair from the same individual and incorrectly concluded direction of growth was unique to an individual. The ribbing of the above two shells illustrate three concepts: the logarithmic spiral growth pattern, chirality, as well as how I came to that wrong conclusion: that two individuals can grow in different directions. It was a logical hop to understand how, to make two shells hinged at the source of the growth spiral, each individual requires two halves, each a mirror image of the other. That every member of the species demonstrated the same asymmetry, each half grows in the opposite direction. The above photograph shows attached matching halves. The attachment point was a surprise: the apparent source point is not attached to the ligament joining the halves? I have yet to understand this. Do you? The top three shells of the first photograph are scallops. The first and last, broken by the waves, are missing parts. The middle scallop, small and off-white, is complete. Place an imaginary line down the center and each side is identical. Applying the real world (i.e., physics) to myth, a scallop shell allows the goddess to move forward in a straight line. Sailing an asymmetrical shell, she moves in an eternal circle. An object with symmetry is visually complete unto itself, self-contained; functionality aside, one scallop does not required a partner. The paired shells are interesting in they do not match, one is deeper, it encloses more volume. The deeper side rests under the surface, allowing the top halve to present a lower profile the better to hide from predators. The scallop echoes the beauty of Venus. Symmetry enhances human features (earch “Venus (mythology)” for images of her face through the ages), though it does not define beauty. An overly symmetrical face seems strange. I will close with an extreme example, the other day I came upon this beach crab wandering around in the daylight. Symmetry does NOT enhance its features. Our long beachcombing adventures are enlivened by wildlife. Grey Herons stalking the surf line, the interface between the Atlantic Ocean and the shore, stop us in place, fascinated. I pack an iPhone sometimes for beachcombing as a lightweight alternative to SLRs. This post features iPhone photographs. There are two varieties of “surfing” Grey Herons: those looking for a handout from fishermen and independent operators. These photographs are of the latter, active feeders searching the wash for edibles: fish and crustaceans. These progress verrrrryyyyyy slooooowwwwllllyyyy, at a level high enough to avoid breaking waves, low enough for their long legs to be submerged. The heron appears to be mesmerized by the waves until, suddenly, the head tilts slightly, the serpentine neck extends quick as a striking rattlesnake, the sharp beak pierces the water to emerge sometimes empty. When successful, the beak holds an improbably large fish. The heron stands there, adjusting the catch with imperceptible head motions, until the victim is aligned lengthwise with the beak and gullet. A quick jerk forward and the catch is propelled into the upper throat, which expands. A few more jerks and it is consumed whole, unchewed. An amazing process to witness and only possible if you take the time for the slow process. Another element is the heron’s tolerance of human observers. These herons ignore us if we keep an adequate distance. Elsewhere, a heron will take wings at the slightest provocation, as simple as a glance of a human and these will fly, uttering a raucous, rasping goodbye. These photographs are from morning excursions, the subject is backlit. Afternoons, we do not encounter many stalking herons when the light is better. The individuals looking for handouts are out in the afternoon, generally, after the fishermen has thinned out. Don’t know why that is. The Catskill Mountains are not mountains. The Catskills started as a high plateau. Over eons, before the first humans, water, the sun, and wind carved high steep peaks: rounded, forested and teeming with life. October 2008, on a return trip from my Mother’s house on Long Island, we traveled the winding road called “Route 17”, through the high autumn hillsides, one of our last trips to see her. She broke her hip on New Year’s and lived with me and my sisters until her 2013 passing. We left Long Island early afternoon, as the sun passed over the western hills we stopped to explore a place called “Fishs Eddy”, a town on the banks of the Delaware River. On the east side, facing sunset is a formation that would be a cliff if it was not for the hardwood trees growing from every available nook, crevice. Everywhere a root could be sunk, roots fed trees that, one late October afternoon, made a hill bright with autumn. Turkeys live in this type of habitat. We took a trail, barely a road that climbed past failed farms and hunting shacks. On a level place, in front of a ruined home, we came upon a Tom (male) turkey and his four hens. The hens fled at the sight of us. With barely time to raise the camera I caught Tom and the last hen as she fled into the bushes. I say she, because Tom stayed behind. He stood erect, all three feet of him, defiant and strutting in a direction opposite from the hens. This is the bird Benjamin Franklin proposed as the national emblem of the new United State of America (the bald eagle won that competition). Hunted into almost oblivion, across the United States the wild turkey is making a dramatic come back in many places, including the forests and farmland of rural New York State. This fellow made no noise. His strutting posture and head bobbing said it all. We left Tom Turkey in peace to his domain and hens. Ricaro’s name tag reads, “Oceania Cruises, your world, your way.” I began my two previous blogs with Ricardo, “Valparaiso Separation” and “Valparaiso Connections I.” There’s a lot to be said for the Oceania tours. Every one lead by a knowledgeable native of the host country, fluent in English, we became familiar, some more than others, with them personally, one non-representative example. As were progressed down the coast from Iquique to Cape Horn we met a cross section of Chileans. Unlike other countries, in Chile we met only unsmiling guards on the streets, no protest rallies. As the tour bus is about to turn down Varparaiso’s Argentina Avenue, here is a flash forward to an elaborate demonstration tableau in the Plaza de Mayo, the Casa Rosada as a backdrop, rose as in the color of bull’s blood used as pigment. The protest was in support for veterans and causalities of the ill considered 1982 Falklands War. We zoomed by the Parque De La Memoria, dedicated to the 30,000 people “disappeared” by the same military dictatorship of the Falklands War debacle. Our entry to both Valparaiso and Buenos Aires was a cruise over the secret graves of thousands dropped, alive, into the ocean from military aircraft. What is most chilling is the silence about this throughout our travels in Chile. No memorials, no protests, silence, only stone faced military guards. The following is from Basílica y Convento de San Francisco de Lima, beneath which are catacombs piled with disarticulated skeletons buried and cared for in the Catholic tradition . In Lima’s Plaza de Armas we witnessed this peaceful demonstration by pensioners protesting low payments. To be honest, around this time, in Chile, there were huge demonstrations, hundreds of thousands in Santiago, about the same issue. The Lima crowd was peaceful. Watched by a heavy contingent of armed police supported by large “paddy wagons” to cart people away. The vehicle marked “Prodegur” (i.e., prosecution) was one of them. Given the history of government disappearances in the region, how brave the demonstrators must be. Our vehicle turns onto Argentina Avenue, passing under Spanish Avenue and these supports bruiting the “Patrimony of Humanity” status of Valparaiso. Turning onto Argentina Avenue, the overpass support columns announce Valparaiso’s status as a World Heritage Site. It is the old city around the port which holds this designation. I wonder how a man of a certain ago scrapes his knees, these appear to be homeless people. Two men carry on conversation on Avenue Argentina, Valparaiso during the weekend Avenue Argentina street fair. They gives us big smiles and waves when they spotted me / us. The people were open and friendly. We’ll start in the parking lot of the Valparaiso Passenger Terminal, introduced in my last posting, “Valparaiso Old and New”. The terminal was our first stop in Valparaiso, it services cruise ship passengers, it was in the parking lot we met Ricardo, a guide and city native. In his late sixties, Ricardo lived through numbing changes: the political turn left and election of Allende, followed by a military coup d’état (called golpe de estado in Spanish) and rise of a military officer, Pinochet, to dictator. From the 70’s through 80’s Pinochet ruled, abolishing the congress in Santiago, enjoying ruthless suppression of opponents with the full support and assistance of the military. In the late 80’s Pinochet allowed a return to democracy, a new constitution with a bi-cameral (two houses) congress in Valparaiso and elected president. Ricardo was quiet about these times, as are most Chileans and we did not press him. Click any photograph to open my Fine Art Gallery. The bus passed a carved wooden statue of the albatross, near the terminal entrance. A bird of the southern ocean, familiar to mariners for the habit of following ships, this aspect of soaring the a familiar posture. Here is a specimen in this posture following the Regatta on February 22 as we traversed the Southern Atlantic between the Falkands and Punta del Este. That day, many albatross soared among the 20+ foot waves, the wingtips very close to the water surface. The day before, February 21, the Regatta approached the southern most point of the western hemisphere, Cape Horn, coming within a mile of the landing point and monument. At the top you can see the steel sculpture of the outline of an albatross set in a stone plinth. A cropped version of the above image, the albatross outline is easier to see. Also visible, at the cliff base, the landing, stairs, a platform painted as a Chilean flag, the railings leading up to the Albatross Monument. All of this to emphasize the unique position and reason for being of Valparaiso of the eastern South Pacific, made evident by the recurring motif of an albatross soaring among the waves. This retired anchor, close to the albatross sculpture, on our way to Argentina Avenue and the weekend street fair (to be continued).